In February 2018, we began pulling down the old sheltered areas of the Kratie English School to make way for three brand new inclosed classrooms that will be safe from changing weather conditions. As of March 2018, Kratie English School is equipped to operate all year round; thanks to those who donated to Project Cambodia’s ‘DONATE A DESK’ initiative. Project Cambodia and Mr. Rith from the Kratie English School will begin to work closely together to ensure we are providing quality education to the 140 students. Welcome to Kratie English School. We are a non-governmental initiative founded by Mr. Chheun Rith and sponsored by Project Cambodia; an Australian organisation founded by Leon Pope. Together we utilise humanity and cultural curiosity in everyday travellers, and offer them a local insight in exchange for their time two hours per day to teach English to our students. Mr. Rith has opened his home located in Orussey Village outside Kratie Town, to support local children to learn English, which is not taught in the public school curriculum. 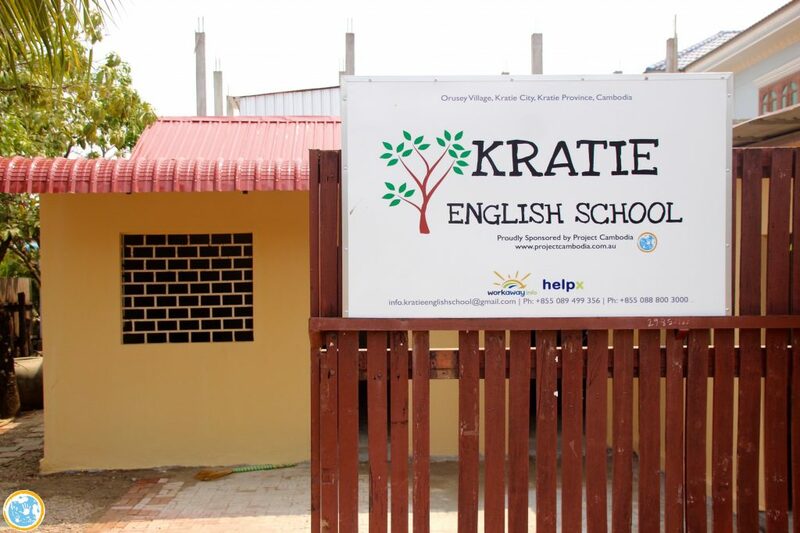 Kratie English School currently supports fifty children aged 7-16 years old. Our newest project over the past year has been including the young monks from the local monastery and pagoda into our mission. 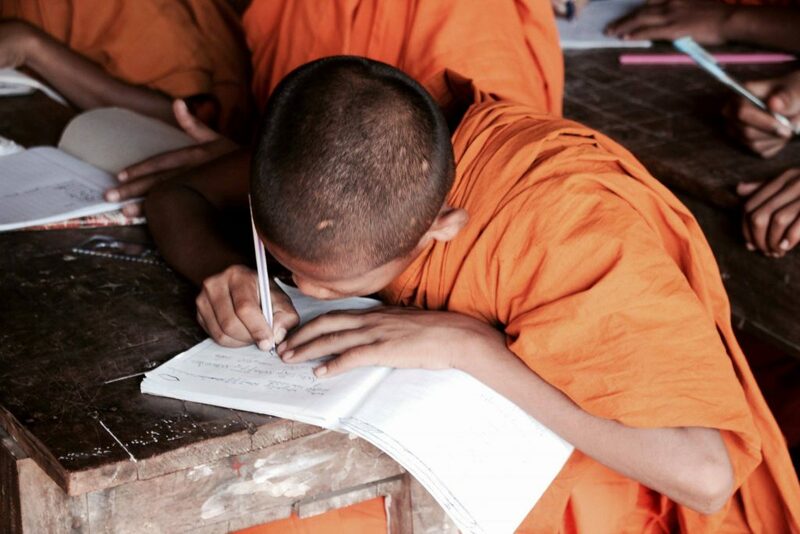 We teach around 60 Monks in total, which are split into intermediate and basic classes. For many of our students, our school has given these children their first opportunity to learn English, and we’re very proud of how far they’ve come. We teach the Monks out of the local pagoda, which is a three minute walk away from our school. The rest of the classes are taught straight out of our school classrooms. 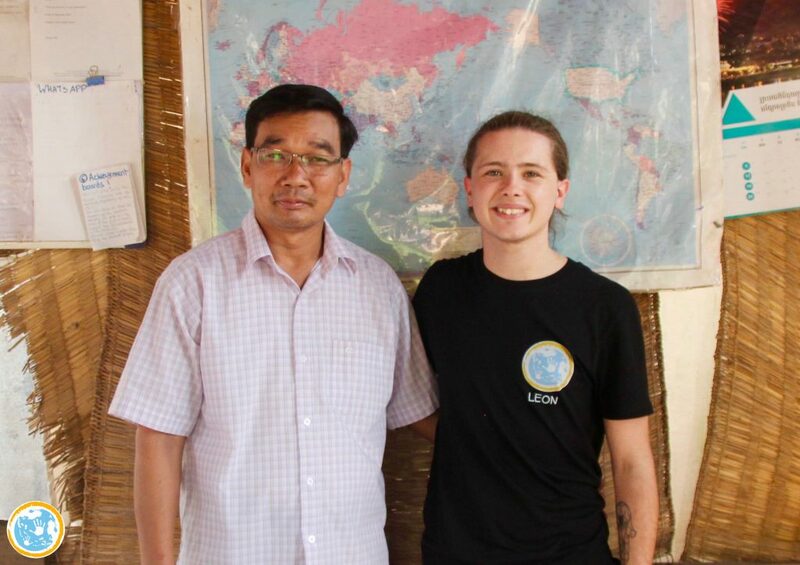 In February 2018, Leon and the team from Project Cambodia funded the construction of three new classrooms for our students, as well as a new lesson planning space for our volunteers. 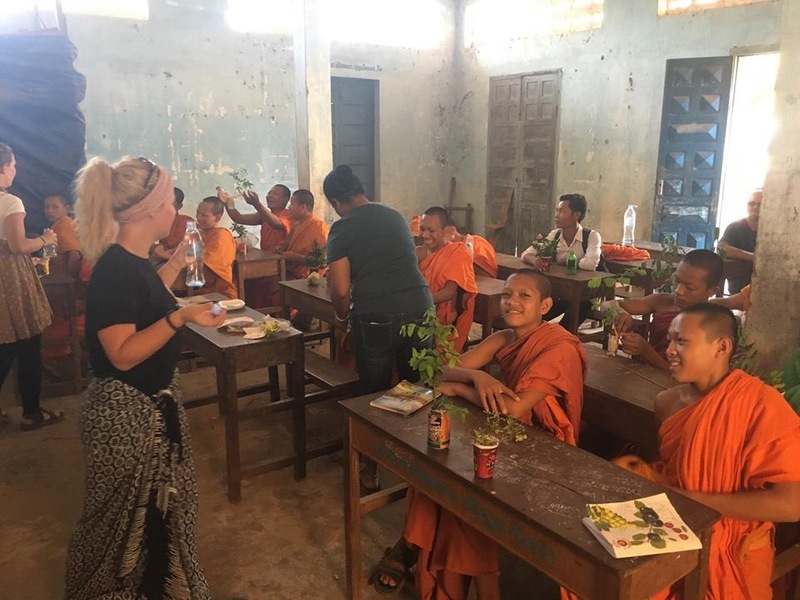 Project Cambodia have become more involved in the school to ensure the students are reaching their full potential, and volunteers are gaining an authentic insight, as well as having some fun! We are also happy to make arrangements with the public school, to see where you’re able to assist; for those looking to do more around the village. No experience is required, just passion and enthusiasm! Our volunteers staying onsite at the school are asked to make a $5USD contribution towards their meals and accomodation each day. A minimum stay of two weeks is also recommended to ensure the children remain engaged and get to know your teaching strategies. If you’re looking for an authentic Cambodian experience then look no further than our school. We’re located in Orussey Village on the outskirts of Kratie, approximately five hours away from Phnom Penh, by bus. If this sounds like it’s for you, please contact us on info.projectcambodia@gmail.com for more information and book your volunteer experience with us at the Kratie English School.